Hobbies: A big sports fan, both playing and watching, he also enjoys music (going to concerts), reading and travelling. Craig is also a bit of a politics and history ‘geek’! After graduating in Economic History from the University of Glasgow, Craig moved into Financial Services in 2000 and completed the Financial Planning Certificate in 2003. 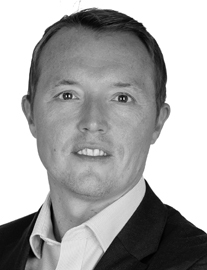 He worked as an independent adviser in Glasgow before joining The Spectrum IFA Group in 2006, to develop the business in both The Netherlands and Belgium. Craig speaks fluent German and has a good understanding of Dutch. He is very active in the business community and founded the Amsterdam Business Lunch networking group in 2009. He is also a member of the Commercial Anglo-Dutch Society (CADS) and is an active member of the Amsterdam Toastmasters speaking club.